The ones I end up “needing” price in the hundreds of dollars. I don’t feel they are safe. I can’t tell you how many people I know that are constantly burning their arms because of their wand. So I’ve been waiting to find something from a good brand that’s affordable, and safe. After Silvia’s insistence that I HAD to check out the Ipsy Offer of that day; I quickly pressed the pink BUY button. 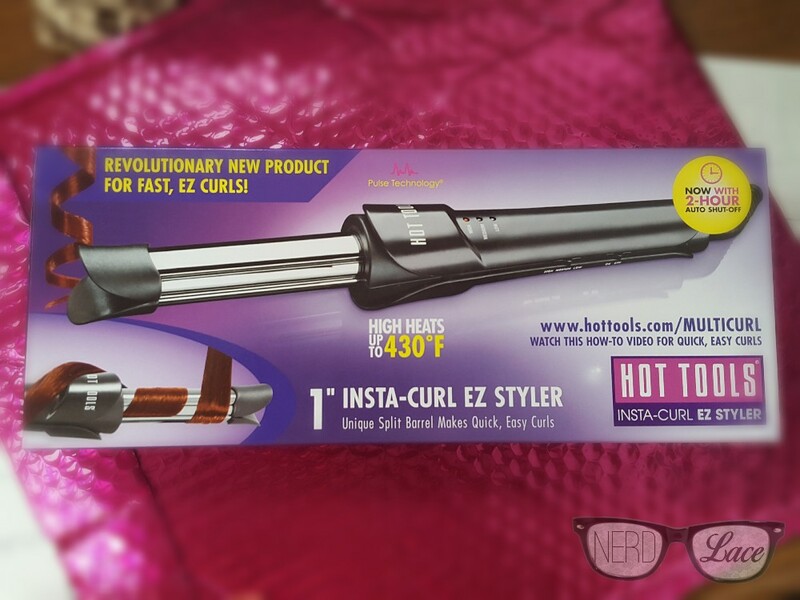 How could I pass up a Hot Tools Insta-Curl EZ Styler for only $24 US? When the regular price is $55 USD. You don’t pass it up. You buy it! The selling point for me was the split barrel and the protective tip on the head of the wand. Could I have found my perfect curling iron? … let’s find out. Hair Type: curly, frizzy, and a lot of hair. Length: Long. Down to my waist. Above is my hair in it’s natural state after lots, and lots of product. And as you could see, my hair lives by it’s own motto: YOLO, I do what I want. It took about 30-40 seconds for the wand to heat up, enough time for me to set in some heat protector on my hair. The directions: Section your hair off, and slide the section of hair between the plates to the bottom of the barrel before rotating iron continuously to create a quick, easy curl. Easy enough, and you know it really was that easy. Within seconds I had accomplished a few curls. The one complaint I have about the wand is that my crazy hair, don’t care, gets stuck on the protective tip at the end. Be careful when you’re letting out your hair. I give this wand a solid 4 Nerd Glasses out of 5. Great price, from a well known brand, and a product that has the features I’ve been looking for. Keep in mind that you do not need to be an Ipsy subscriber to take advantage of the Ipsy Offers. However, if you do want to subscribe, there’s currently no wait-list. Click here to join Ipsy. Do you have this curling wand? Sound off below, or on social media by using the hashtag #nerdandlace. Also, follow us on Instagram, Facebook, and Twitter.